Sodalite is a deep royal blue silicate mineral. It is usually mottled with light blue, dark blue, and white. The deep color and the fact that it will take a high polish makes it popular in jewelry and other decorative items. It is also a favorite with collectors. While this mineral is known for its blue color it can also be gray, green, yellow and pink. The chemical formula is Na8Al6Si6O24Cl2. The name comes from the sodium content in this mineral. It is relatively hard, 5.5 – 6 on the Mohs scale. It has poor cleavage is very brittle and has a white streak. Lazurite, nosean, hauyne, and tugtupite are related minerals that together with sodalite is known as the sodalite group. These minerals are found in veins running through Plutonic igneous rocks. 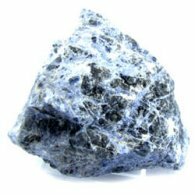 Fine grades of Sodalite are found in only a few places in the world. Bancroft Ontario, and Mont-Saint-Hilaire, Quebec, Canada. It is also found in Litchfield Maine and Magnet Cove Arkansas in the US. Smaller quantities are found in Brazil and Bolivia in South America and Romania, Portugal, and Russia in Europe. Burma and Greenland also have significant deposits. Location: Bancroft Ontario, and Mont-Saint-Hilaire, Quebec, Canada. It is also found in Litchfield Maine and Magnet Cove Arkansas in the US. Smaller quantities are found in Brazil and Bolivia in South America and Romania, Portugal, and Russia in Europe. Burma and Greenland also have significant deposits. Metaphysical properties: Sodalite has a calming affect. It is also inspirational for Artists, musicians and other creative activities. It is said to relieve insomnia.